AR’s potential ability to concurrently display imaging data and other patient information could save lives and decrease medical errors. This is especially true for procedures done outside an operating room. The OR may be the safest place in the hospital, where one patient has an entire team of 4 to 8 dedicated doctors and nurses. Because everyone has pre-operative imaging, the procedures are generally well-planned. Anesthesiologists monitor the patient’s physiology and administer pain-controlling and life-saving medications. Surgical nurses make sure all of the necessary equipment is immediately available. Surgeons can be completely immersed in the operative task. But time in the room is extremely costly, and ORs are solidly booked with elective cases. Elective operations are an essential source of revenue for all hospitals, so there is incredible pressure to keep ORs full and flowing. Small, emergent procedures do not easily fit into this reality. As a result, many of these procedures are done outside the OR in intensive care units and emergency departments. It’s during these “bedside procedures” that patients may be most at risk and where AR could provide some of the greatest benefit. Unlike operations in the OR, bedside procedures have minimal support. There is usually one doctor and one nurse, both of whom have other responsibilities. Often the patients are physiologically unstable. If it is late at night, the physician performing the operation may be a junior trainee, who has both the anesthesiologist’s and surgeon’s roles. The rooms are not specifically designed for procedures, especially those that involve cumbersome carts for imaging. The situation is made worse by a tangle of patient monitors. In tracking multiple image and data displays, it is easy to miss vital cues regarding the patient’s status. A single AR display that integrates all imaging and patient data and allows doctors to keep their eyes on the patient has the potential to improve quality, safety and reduce cost by decreasing procedure-related complications. In addition to cost reduction from safer procedures, there is also the potential to reduce costs by eliminating the need for redundant screens. Currently ultrasound, endoscopy, and bronchoscopy all require hospitals to buy entire systems, each with its own display. The systems can cost upwards of hundreds of thousands of dollars each. It is not that different modes of imaging require special displays, but that the current economic model is to sell whole systems with incompatible imaging devices. The electronic medical record has its own display. Hemodynamic monitors and ventilators each have their own separate screens, and that data is not merged. AR can provide a shared display, eventually reducing the need for a dedicated monitor for each aspect of a patient’s data, while providing a place where physiological data from multiple sources can merge in real time. 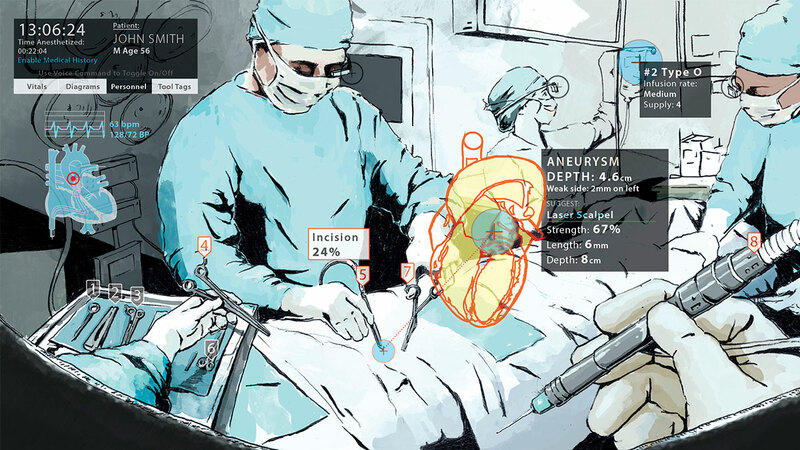 AR technology still needs to evolve for this all to be realized, and doctors need to buy in to the concept. Hardware needs to fit comfortably and securely on the practitioner’s head. For some applications the images will need to be as opaque as possible, while for others they will need to be more translucent. If the projected images are being used for operative guidance, they need to be positioned with extreme accuracy. There are a variety of technical challenges, but none of them are insurmountable. At our Maryland Blended Reality Center, we are committed to investing in the future of AR as a primary tool to help health care providers save lives while also reducing medical costs. Teams at Stanford, Duke and Johns Hopkins are also working to merge and project visual data, while simultaneously creating AR displays ideal for patient care. It will take gifted computer scientists and visionary physicians to make augmented reality an actual reality in medicine. But we are excited for the future, where the use of AR in health care will be just as commonplace as use of a stethoscope. Sarah Murthi, MD, is an Associate Professor of Surgery at the University of Maryland School of Medicine, R Adams Cowley Shock Trauma Center. Amitabh Varshney is Dean of the College of Computer, Mathematical, and Natural Sciences at the University of Maryland, College Park.